This is an audio capture tool development kit. 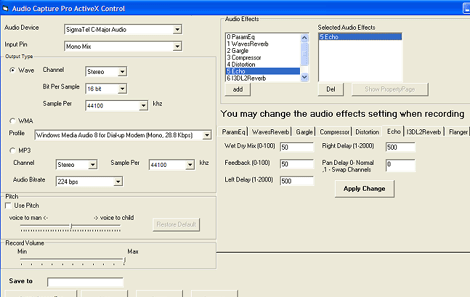 Audio Capture Pro SDK ActiveX 2.0 is meant for the Windows platform. Applications that need to include audio capture, record from audio input pin and add audio mixing, etc. can utilize this kit. Audio device output can be captured into wav, wma, mp3 audio formats. If required, a waveform display can be included. Display of both left and right channels are possible. Audio can be captured from a selected input device. Audio mixing capabilities exist so that an audio from a selected device could be mixed with a particular speaker as required. Input sources could be selected from the selected audio pin, and these could be used to capture online streaming audio, radio, audio players, Line In, Microphone, Stereo Mix, Mono Mix, Aux, Video, CD Audio, Phone Line, etc. Recording can be paused and resumed. Volume levels of the mixer line could be adjusted. The display background color, left/right channel waveform color, offset, divisor of a waveform, etc. could be customized. Display of floating popup waveform window or child style of a waveform window is possible to be set up. Pitch of the voice could be changed from male voice to that of a female or a child. Languages that are compatible with the ActiveX technology can take advantage of this SDK. These include c# 2010, c# 2005, VB.Net 2010, VB.Net, VFP, VB, VC, Delphi, etc. Sample source code is included to help developers integrate the functions. The OCX getting distributed with the application is royalty free. This is a very good tool.